There is a completely amazing and wonderful world hidden under the waves, full of fantastic sea creatures and fish. Do you know any interesting underwater facts? Try using the code in this puzzle to see what ocean fact is hiding under the sea. 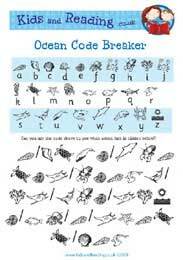 Why not Download the Ocean Code Breaker Puzzle and see what a great code breaker you can be. This activity is aimed at 5 to 8 year olds, it's a fun way to raise your child's interest in words and puzzles, as well as building their reading skills.